Today is my sister’s first wedding anniversary. Which means that one year ago today, I got up a tad earlier than usual and made her a lemon meringue pie. It was their “bride and groom” celebratory slice as they had pies for their wedding reception rather than cake. 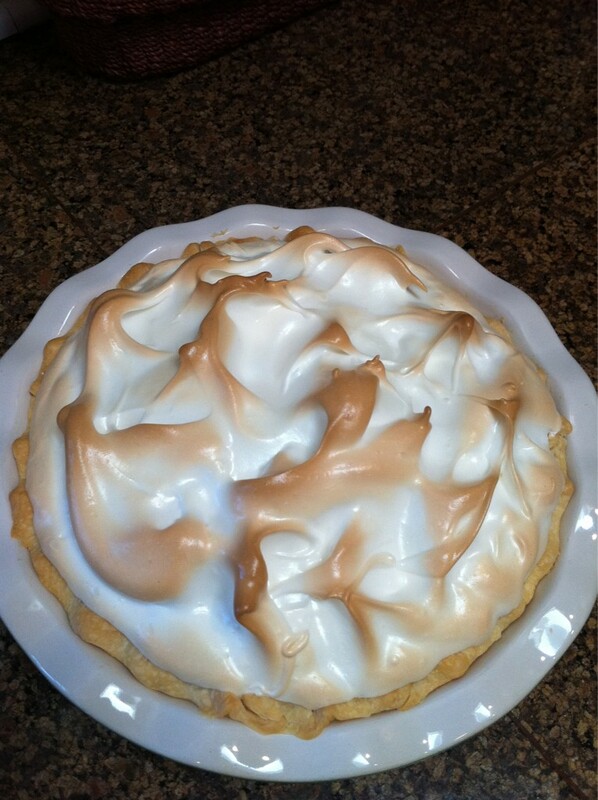 Lemon meringue pie is a lovely striation of yellow and whites and hues of creamy tans. Always reminds me of sunshine and the beach. Lemon meringue pie is both sweet and sour. Rather like life, don’t you think? A lemon meringue pie isn’t terribly hard to make but it looks exotic and rarely graces our “everyday” table — it is saved for what seems like special occasions. If you do everything right and follow the directions perfectly, the meringue just might weep and pull away from the crust anyway. It will taste exactly the same even if its appearance may seem disappointing. It is a good reminder that sometimes what matters most is not what we see with our eyes but with our other senses. Ask any lemon meringue pie eater about what lemon meringue makes them think of…the stories are beautiful and filled with people who made a difference in their lives. When the sun shines, like it is today, lemon meringue pie is like sun beams on your tongue. Just a quick little note before I head on over the the Boomer Lifestyle show at the Portland Expo Center. Baby Boomer. Such a fun little name. Unlike Generation X. Come on Douglas Coupland, that’s all the better you could do? I know, I sound like a judger and all that, but I feel like I’m either just a chromosome or a mark on a map. You all have a great weekend and if you’re living large like me, enjoy the sunshine. I’m grooving on my sweet little bursts of sunshine out in my front flowerbeds.